Health workers are at the heart of everything we do here at IntraHealth International. They’re the core of our mission, the core of our 56 ongoing projects around the world, and the core of the very systems that provide health care for us all. So we’re pumped. 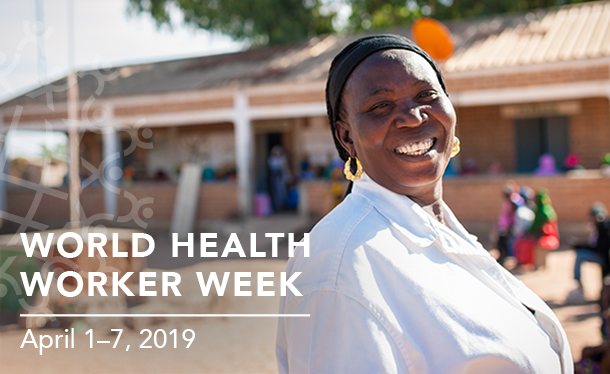 Because today marks the start of World Health Worker Week, a time of year when stakeholders around the globe come together to advocate for greater investments in frontline health workers worldwide. Join the conversation on social media: #WHWWeek and #HealthWorkersCount. Check out this social media guide provided by the Frontline Health Workers Coalition for tips. Follow IntraHealth on Instagram this week to see health workers in 5 places you might not expect. Participate in our #WHWWeek Twitter chat on Tuesday, April 2, 10 am. We’ll talk about who’s on your health worker dream team. Come to our congressional reception on April 4, 5 – 7 pm. Thank a health hero you know through Instagram and Twitter. Make a video testimonial to tell policy-makers why health workers count. Urge UN Member States to take bold action to ensure the health workforce needed to achieve primary health care for all and universal health coverage. Stay tuned to IntraHealth’s blog VITAL and the Frontline Health Workers Coalition blog for stories about health workers on the front lines of care.